I think self care and positivity go hand in hand. The more we take care of ourselves, the better we tend to feel. 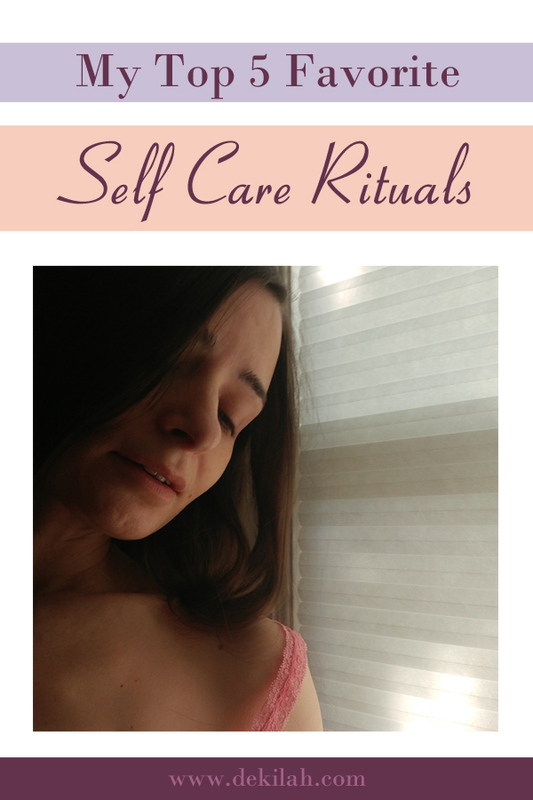 However, I think that self care can be a difficult practice to get into so I wanted to share 5 of my favorite self care rituals with you along with a few tips for developing your own. Before we jump in, I wanted to make a little side note to the guys reading this: Self care isn’t just for women! You guys should be practicing it as well. My favorite form of self care is hands down skin care. I really love sheet masks, but I have a whole cabinet (okay, actually two) full of skin care products. If I feel I’m having a rough day or I know my skin needs a little TLC, I’ll use a sheet mask while I relax in the tub. And my personal rule is no stressful stuff on my phone while I relax. I usually play a game (Kingdom Hearts Unchained X is my favorite) or scroll through posts on Instagram. The benefits of this particular self care routine are that it makes me slow down and just relax for a bit. Plus, it’s great for my skin and my face always feels better the next morning. Guys, you can use sheets masks too! Don’t be afraid to take care of your skin. Good skin is a universally nice thing. I’m pretty open about my enjoyment of ASMR which I suggest Googling if you’ve never heard of it. I use it as a relaxation and pain management technique. It distracts my brain so I can start to let go of anxious, stressful, or otherwise negative thoughs. It helps me relax physically. If you’ve never explored ASMR videos on YouTube I definitely recommend it! There are quite a lot of types of videos out there and even if you don’t experience the tingles, most people still find the right triggers to be relaxing. I think ASMR is one powerful self care tool. Here is my ASMR channel if you’d like to check it out: Dekilah ASMR. And while you’re at it, you might find some of my stockings videos and such on my main channel to be relaxing too. There is something about preparing a cup of hot tea that I find incredibly relaxing. Even if I’m really on edge or even upset I still stop and take my time. It’s just something I do automatically. Yes, I’m one of the ones that heat a cup of water up in my microwave. I like to use cute vintage tea cups, but you can use whatever you have. While the water is heating, I like to choose the right tea from my fairly vast collection. Sometimes I have no idea what I want and I just try something. Other times I go for a favorite which is usually some form of chai tea. Next I slow dip the tea bag into the water until it finally gets full soaked. I press it down with a spoon. Sometimes I like to press the tea bag with the spoon and watch as the water changes color. Once it’s done, I lift the tea bag out and use the spoon to press it out. I usually give it a few minutes to cool down, so I’ll sometimes go do a quick chore. And then I take my cup and I sit down on the couch to enjoy it. The warmth in my hands and the action of sipping tea is wonderful! If you happen to not like tea, you could always try some hot chocolate, too. I used to kind of raise my eyebrows at the idea of meditation. I didn’t think I’d be able to shut my mind off anyway. But finally, this past year I decided to stop shutting down something I’d never tried. I downloaded the Headspace app for some guided meditations. I learned some invaluable techniques in just the first few sessions from the free version of the app. That has been the single best thing I’ve done to help learn to better cope with stress and anxiety. I sit in my chair cross legged with the lights off when I meditate. I’ve found that’s a very cozy, calming place for me. You could try sitting on your bed, in the middle of your couch, or where every you like. Just choose a place that you feel comfortable. If you aren’t already meditating, I’d say give it a chance. It doesn’t have to take a long time. The Headspace sessions are 3 minutes to start off and you can tailor them from there on. And no, I’m not sponsored by Headspace. I just really like the app. If you guys have suggestions for other similar apps, please share them in the comments. I know I’m not the only one who has certain items of clothing that I love. I think just about everyone has that shirt or sweater or socks they just love. For me it’s been this oversized, blanket-like cardigan. In fact, I’ve done a few selfie session and videos with it. I don’t care that I look like I’m wearing a blanket. In fact, I actually think that’s why I like it. It’s all the warmth and snuggle of a blanket, but it doesn’t fall off. This self care technique is a little less obvious in terms of results, but I think it’s still something that can be soothing. Also, it doesn’t even have to be an article of clothing. It could be jewelry, makeup, or perfume/cologne. Now it’s your turn! Share your favorite self care rituals with me in the comments.